Before team cars escorted the racers, hovering like nervous grandmothers, before there were feed zones, magic spray, magic food or any conception of how hydration works, riders would come into a small town on the Tour de France and raid a soda fountain. They’d run into the shop, steal a bunch of drinks, and run out again, the angry proprietor blocked by rabid fans. Riders would shove a bunch of sodas down their jersey and ride back into the peloton to distribute them to teammates, friends and rivals. 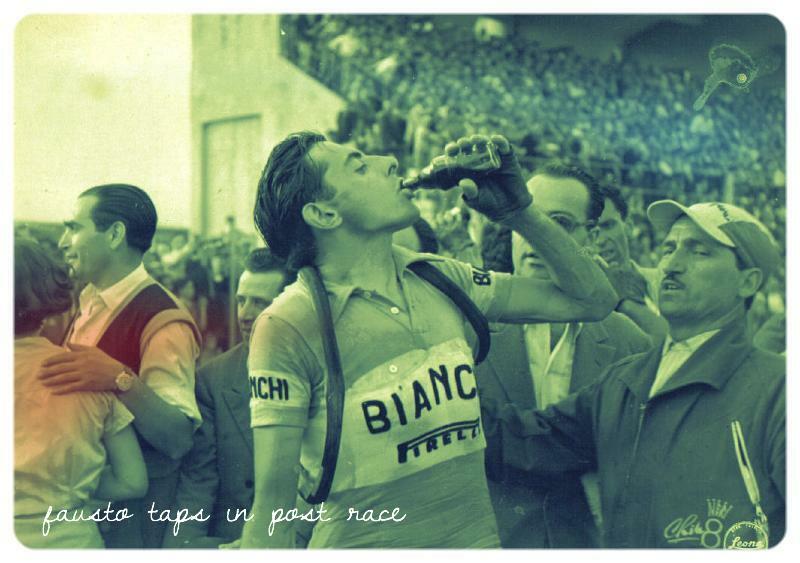 Tom Simpson had a coke a teammate stole from a bar before his fateful climb up Mont Ventoux. Of course, he also had a bunch of speed, some brandy, and was woefully dehydrated on a really hot day. So let’s not blame the coke on his untimely death. It was probably the healthiest thing he ingested that day. There is something cutting and refreshing about coke. The acid and the sugar combination slices through the sickening taste of endless energy food. The caffeine provides a welcome boost when the system is lagging, and the carbonation helps settle stomachs tortured by heat, gels and endless road buzz. Coke was originally served in small glass bottles. My dad tells stories about buying a case of glass bottled coke from the grocery store, filling galvanized pails with ice and soda and heading to South Park to shill the sodas for 10 cents, a 50% profit margin… The idea of a 5 or 10 cent soda never seemed feasible in my lifetime, until I found myself in the Northeast Kingdom of Vermont, at a Soda Fountain tucked in the back of a dusty, careworn 5 and Dime. I assumed the sign for the 5 cent coke was either a joke or a vintage sign but there it was, being served in Dixiecups for 5 cents a pour. So I had a cup or two. At the risk of being cycling’s Andy Rooney, Coke should really only come in glass bottles. Aluminum is what you make rims out of, and stems. Not beverage containers. And plastic… let’s not get started with plastic. The thick, greenish glass insulates the soda, keeping it cold on sweat soaked Maryland summer days. My favorite stop on long whatevering rides is the Mountaindale Convenience Store, on Mountaindale Road, where the back cooler houses 8 oz glass bottles of Coke. They have an opener behind the counter, but it’s best to use a pedal or a multi-tool. That, and a frozen Snickers bar, and you can climb anything. Sunday night whatevering rides. Join James, Andre, Dan the Younger, and whoever else on a 30-45 mile ride thru the local backwoods. Dirt, climbing, pain, but at a slow, semi conversational pace. Might be some singletrack, dirt roads, etc. We’ll stop, chat, swim, whatever. Roadish bike. Bring tail light and a good head light, too. 200 lumen min. Good means you could go down a black tunnel covered in dirt at night with it. Meet at 5 at the shop, wheels down at 5.30. Check Facebook for weather updates. best wordpress yet. glad to know i am not alone in a cool sip of Coke. and everyone knows real stems are made of steel. preferably lugged. aluminum is for oversized DH monstrosities. Coke should also only have sugar in it , not the corn syrup that they use.